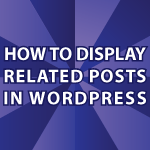 I received many requests recently on how to display related posts on a WordPress site. The code I present in the video below will grab as many related posts as you want and display them in your WordPress post. The code grabs related posts based off of them being in the same category. It will also work if you have a post in multiple categories. I could have picked the related posts based off of tags, but I thought categories made more sense. I include both the code from Single.php and home.css below. In the video I use a function called catch_that_image(). If you want to see how that works check out WordPress News Theme 5. ‘posts_per_page’=> 4 // Number of related posts that will be shown. Thanks for your fantabulous video tutorials. Specially, your wp tutorials are excellent. But I have further request, please make some videos on WORDPRESS CUSTOM FIELDS – all aspects of custom fields. So far I know custom field option is very useful to make WP a true CMS. But unfortunately you didn’t mention or use them in your tutorials (upto part 8 of wordpress theme tutorials). Hope you will make some superb tuts on it. PLEASE I NEED TO KNOW THEM VERY WELL. HOPE YOU WILL HELP ME AS I STARTED TO LEARN WORDPRESS WITH YOUR TUTS. I’m glad you like them. I was shocked that nobody had done a WordPress Video tutorial so I just had to make one. Here is a tutorial on WordPress custom fields and taxonomies. It should answer some questions. I’m going to make more WordPress tutorials, but I’ve been covering some overdue tutorials lately. Hi, I have a question for you. I want to post some tags on one of my post with a song. I want to add a tag with the name of the artist that exists in another post and if someone clicks on the tag he gets redirected to that article. Is it possible? Does this code do that for me? Also can you make a tutorial on how to click on an image into a post and that specific picture pops out like it’s an attachment or something like that and also I can view the photos if there are more than one? Yes this will display posts with the same tags. It should do what you want. You could also increase the number of related posts displayed if you’d like to see more. For example if you click on the image of the first post in this blog http://www.kristofer.ro/ it shows you kinda like a slideshow or something, the image gets bigger. The editor in the dashboard normally works, but at times is buggy. It is better to download the files directly using ftp. is there a way to tweak it? That is odd. I just tested it and it worked for me. Did you change the code?